Informed with a background in illustration from Ontario College of Art where she won various awards for her artwork, Laurie Campbell went on to gain hands-on experience working with a variety of commissioned projects with numerous Canadian publications that include the Globe and Mail and Homemaker's Magazine among others. As an artist, Laurie Campbell, illustrated Outsmarting Your Karma for the author Barry Neil Kaufman, as well as other books over the course of her career. A born and bred Montrealer, Laurie Campbell returned in 1994. The city's rich cultural and architectural history, its landmarks and scenes of daily life has provided a living heritage for the artist to draw upon. 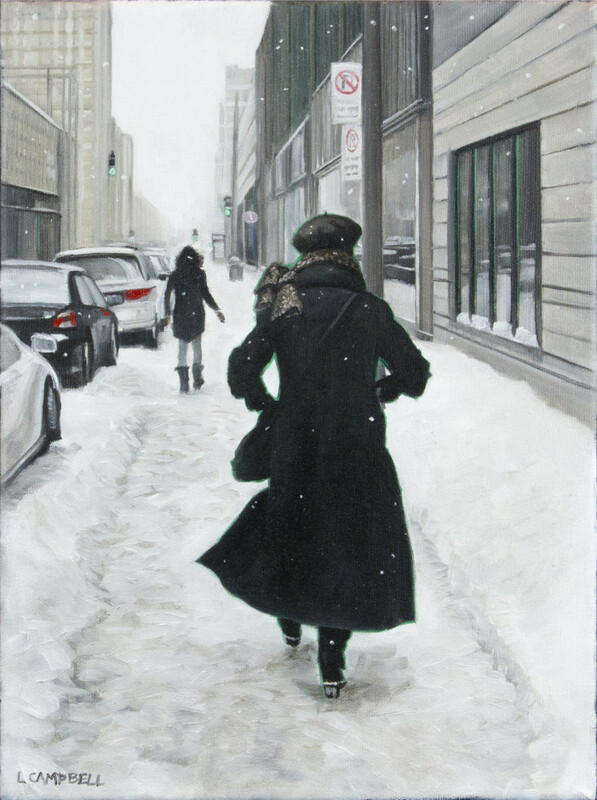 Campbell's paintings of people walking to work in the downtown business district, or at the corner store depanneur, all capture the drama of daily life. Like an anthropologist of the everyday, Campbell goes by foot, or on bicycle to record the cliches and snapshot-like moments of urban existence. The artist then reworks these scenes at her studio into larger oil paintings. Many of these scenes, such as the old newspaper stand, the woman dressed in her daily attire shopping at the neighbourhood corner store, a rooftop vista that captures a collage of architecture from different eras all in the same view, are changing, and may not be there in the same way in a few years. So these paintings themselves will enter into that panoply of historical moments, caught by artists, as time goes by. Influenced by realist painters of the past such as George Bellows, John Sloan, Edward Hopper and the French Impressionists Gustave Caillebotte, Lucien Pissarro and Edgar Degas, Laurie Campbell has produced a remarkable array of paintings that document the places and structures of our cities in watercolour and oil. As times change, so do the contexts we live in, and Laurie Campbell captures the heritage of our past, but does so with a sense of place in the moment. Many of the scenes she paints are significant urban landmarks. Each of us gains a sense of who we are, and where we come from, from knowing the places we live and work in have a history that extends into the past. The city has a living history that Campbell seizes on, painting in a style that is sometimes nostalgic, other times gives us a sense of the moment. Just as these city streets have served countless generations before us, they continue to evolve and will be there for future generations. And so Laurie Campbell paints this urban theatre with its living history of people, architecture, and public spaces with a love for these places and their naturalistic scenes. This has been, and remains, the focus of Laurie Campbell's art. She captures the gestures and movements of people in their daily activities and routines, always with a sense of the specifics of place, and the details of the architecture, the clothing people are wearing, all carry a cachet of that past history, and present-day life. Laurie Campbell is a painter whose eye for the momentary detail, engages something that goes beyond the moment and builds into a dialogue with other times, but in the present. The Canadian Society of Painters in Watercolour, elected in 2002. 2002 - The Adirondacks National Exhibition of American Watercolors, Old Forge NY. Museum, New York (April). PBS Broadcast April 29th, 2000. 1996 - The 34th annual Thomas More Art Exhibition, Maison de la Culture, Montreal. 1993 - The 31st annual Thomas More Art Exhibition, Maison de la Culture, Montreal. signed "L.CAMPBELL" (recto, lower left).